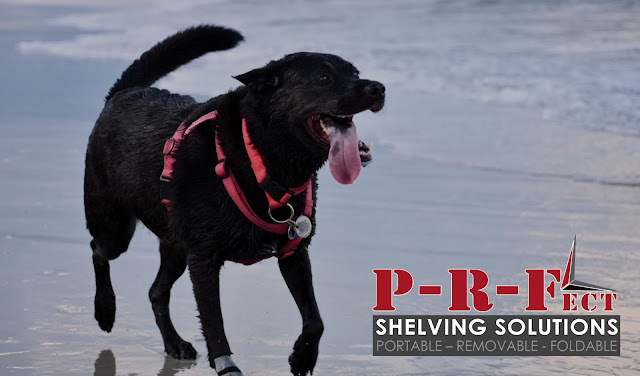 PRF Shelving takes a break with Luna every day. Luna is our silent partner; she does not say much, but she is quite involved with the company. If you check out the videos on the web site and on You Tube, you will see her in a few of them wandering around or laying by me while I work. She is always by my side and I love her. Every day, I take her for her walk along side the Halifax river here in Ormond Beach. She is a rescue like myself, and we have a lot in common. Although she is seven years old, she is like a child and has an endless amount of energy. I am in my fifties and I too, possess boundless energy and think much like a child. Just as Luna, I see the world as my play ground and enjoy existing and playing and being with her, my boys, my wife, and long time friends. I enjoy working, creating, sharing my ideas and thoughts. Life is absolutely joyful and Luna sees it the same way; and we both did not always see it that way, until someone entered our life and offered us something more.